ENGINE OIL SUMP DRAIN PLUG. Make Model Engine Month/Year KW HP CC Type. BMW 1 (E81) 116 i 03.07 - 11.11 90 122 1599 Hatchback BMW 1 (E81) 116 i 11.08 - 12.11 90 122 1995 Hatchback BMW 1 (E81) 118 i 09.06 - 12.11 105 143 1995 Hatchback BMW 1 (E81) 120 i 09.06 - 12.11 120 163 1995 Hatchback BMW 1 (E81) 120 i 09.06 - 12.11 125 170 1995 Hatchback BMW 1 (E81) 130 i 09.06 - 12.11 190 258 2996 Hatchback Automatic Transmission. BMW 1 (E81) 130 i 09.06 - 12.11 195 265 2996 Hatchback for vehicles with automatic transmission. BMW 1 (E81) 116 d 11.08 - 12.11 85 116 1995 Hatchback BMW 1 (E81) 118 d 09.06 - 12.11 100 136 1995 Hatchback BMW 1 (E81) 118 d 09.06 - 12.11 105 143 1995 Hatchback BMW 1 (E81) 120 d 09.06 - 12.11 120 163 1995 Hatchback BMW 1 (E81) 120 d 09.06 - 12.11 130 177 1995 Hatchback BMW 1 (E81) 123 d 03.07 - 12.11 150 204 1995 Hatchback BMW 1 (E87) 130 i 03.05 - 09.12 190 258 2996 Hatchback Automatic Transmission. BMW 1 (E87) 130 i 03.05 - 09.12 195 265 2996 Hatchback Automatic Transmission. BMW 1 (E87) 116 d 12.08 - 09.12 85 116 1995 Hatchback BMW 1 (E87) 118 d 11.03 - 02.07 90 122 1995 Hatchback BMW 1 (E87) 118 d 09.06 - 06.11 100 136 1995 Hatchback BMW 1 (E87) 118 d 09.06 - 06.11 105 143 1995 Hatchback BMW 1 (E87) 120 d 03.03 - 06.11 120 163 1995 Hatchback BMW 1 (E87) 120 d 09.06 - 06.11 130 177 1995 Hatchback BMW 1 (E87) 123 d 03.07 - 09.12 150 204 1995 Hatchback BMW 1 Coupe (E82) 120 i 10.07 - 10.13 125 170 1995 Coupe BMW 1 Coupe (E82) 125 i 10.07 - 10.13 160 218 2996 Coupe Automatic Transmission. BMW 1 Coupe (E82) 135 i 10.07 - 10.13 225 306 2979 Coupe BMW 1 Coupe (E82) 135 i 10.07 - 10.13 240 326 2979 Coupe BMW 1 Coupe (E82) M 04.11 - 06.12 250 340 2979 Coupe BMW 1 Coupe (E82) 118 d 09.09 - 10.13 100 136 1995 Coupe BMW 1 Coupe (E82) 118 d 09.09 - 10.13 105 143 1995 Coupe BMW 1 Coupe (E82) 120 d 10.07 - 10.13 130 177 1995 Coupe BMW 1 Coupe (E82) 123 d 10.07 - 10.13 150 204 1995 Coupe BMW 1 Convertible (E88) 125 i 03.08 - 12.13 160 218 2996 Convertible Automatic Transmission. BMW 1 Convertible (E88) 135 i 03.08 - 12.13 225 306 2979 Convertible Engine Code: N54. BMW 1 Convertible (E88) 118 d 09.08 - 12.13 100 136 1995 Convertible BMW 1 Convertible (E88) 118 d 09.08 - 12.13 105 143 1995 Convertible BMW 1 Convertible (E88) 120 d 03.08 - 12.13 130 177 1995 Convertible BMW 1 Convertible (E88) 120 d 03.08 - 12.13 145 197 1995 Convertible BMW 1 Convertible (E88) 123 d 09.08 - 12.13 150 204 1995 Convertible BMW 1 (F20) M 135 i 11.11 - 235 320 2979 Hatchback BMW 1 (F20) M 135 i xDrive 02.12 - 235 320 2979 Hatchback BMW 1 (F20) M 135 i 03.15 - 240 326 2979 Hatchback BMW 1 (F20) M 135 i xDrive 03.15 - 240 326 2979 Hatchback BMW 1 (F20) 114 d 10.12 - 70 95 1598 Hatchback BMW 1 (F20) 116 d 11.12 - 85 116 1598 Hatchback BMW 1 (F20) 116 d 12.10 - 85 116 1995 Hatchback BMW 1 (F20) 118 d 12.10 - 105 143 1995 Hatchback BMW 1 (F20) 118 d xDrive 07.13 - 105 143 1995 Hatchback BMW 1 (F20) 120 d 12.10 - 120 163 1995 Hatchback BMW 1 (F20) 120 d 12.10 - 135 184 1995 Hatchback BMW 1 (F20) 120 d xDrive 02.12 - 135 184 1995 Hatchback BMW 1 (F20) 125 d 08.11 - 155 211 1995 Hatchback BMW 1 (F20) 125 d 08.11 - 160 218 1995 Hatchback BMW 1 (F21) M 135 i 12.11 - 235 320 2979 Hatchback BMW 1 (F21) M 135 i xDrive 02.12 - 235 320 2979 Hatchback BMW 1 (F21) M 135 i 03.15 - 240 326 2979 Hatchback BMW 1 (F21) M 135 i xDrive 03.15 - 240 326 2979 Hatchback BMW 1 (F21) 114 d 07.12 - 70 95 1598 Hatchback BMW 1 (F21) 116 d 12.11 - 85 116 1598 Hatchback BMW 1 (F21) 116 d 01.12 - 85 116 1995 Hatchback BMW 1 (F21) 118 d 12.11 - 105 143 1995 Hatchback BMW 1 (F21) 118 d xDrive 05.13 - 105 143 1995 Hatchback BMW 1 (F21) 120 d 07.12 - 135 184 1995 Hatchback BMW 1 (F21) 120 d xDrive 02.12 - 135 184 1995 Hatchback BMW 1 (F21) 125 d 12.11 - 155 211 1995 Hatchback BMW 1 (F21) 125 d 12.11 - 160 218 1995 Hatchback BMW 2 Coupe (F22, F87) M2 11.15 - 272 370 2979 Coupe BMW 2 Active Tourer (F45) 216 i 02.15 - 02.18 75 102 1499 Estate BMW 2 Active Tourer (F45) 218 i 11.13 - 02.18 100 136 1499 Estate BMW 2 Active Tourer (F45) 220 i 03.14 - 141 192 1998 Estate BMW 2 Active Tourer (F45) 225 xe 11.14 - 100 136 1499 Estate BMW 2 Active Tourer (F45) 225 i 11.13 - 170 231 1998 Estate BMW 2 Active Tourer (F45) 225 i xDrive 03.14 - 170 231 1998 Estate BMW 2 Active Tourer (F45) 214 d 07.14 - 02.18 70 95 1496 Estate BMW 2 Active Tourer (F45) 216 d 03.14 - 85 116 1496 Estate BMW 2 Active Tourer (F45) 218 d 11.13 - 110 150 1995 Estate BMW 2 Active Tourer (F45) 218 d xDrive 12.14 - 110 150 1995 Estate BMW 2 Active Tourer (F45) 220 d 03.14 - 140 190 1995 Estate BMW 2 Active Tourer (F45) 220 d xDrive 03.14 - 140 190 1995 Estate BMW 2 Gran Tourer (F46) 216 i 09.14 - 02.18 75 102 1499 Estate BMW 2 Gran Tourer (F46) 218 i 07.14 - 100 136 1499 Estate BMW 2 Gran Tourer (F46) 220 i 07.14 - 141 192 1998 Estate BMW 2 Gran Tourer (F46) 214 d 07.15 - 02.18 70 95 1496 Estate BMW 2 Gran Tourer (F46) 216 d 08.14 - 85 116 1496 Estate BMW 2 Gran Tourer (F46) 218 d 07.14 - 110 150 1995 Estate BMW 2 Gran Tourer (F46) 220 d 09.14 - 140 190 1995 Estate BMW 2 Gran Tourer (F46) 220 d xDrive 07.14 - 140 190 1995 Estate BMW 3 Touring (E30) 324 td 01.88 - 06.93 85 115 2443 Estate BMW 3 (E36) 318 tds 01.95 - 02.98 66 90 1665 Saloon BMW 3 (E36) 325 td 09.91 - 02.98 85 115 2497 Saloon BMW 3 (E36) 325 tds 05.93 - 02.98 105 143 2497 Saloon BMW 3 Compact (E36) 318 tds 01.95 - 08.00 66 90 1665 Hatchback BMW 3 Touring (E36) 318 tds 01.95 - 10.99 66 90 1665 Estate BMW 3 Touring (E36) 325 tds 01.95 - 10.99 105 143 2503 Estate BMW 3 (E46) 318 d 09.01 - 03.03 85 116 1951 Saloon BMW 3 (E46) 318 d 03.03 - 02.05 85 116 1995 Saloon BMW 3 (E46) 320 d 04.98 - 09.01 100 136 1951 Saloon BMW 3 (E46) 320 d 09.01 - 02.05 110 150 1995 Saloon BMW 3 (E46) 330 d 10.99 - 02.05 135 184 2926 Saloon BMW 3 (E46) 330 d 03.03 - 02.05 150 204 2993 Saloon BMW 3 (E46) 330 xd 01.00 - 02.03 135 184 2926 Saloon BMW 3 (E46) 330 xd 09.02 - 12.04 150 204 2993 Saloon BMW 3 Compact (E46) 318 td 03.03 - 02.05 85 115 1995 Hatchback BMW 3 Compact (E46) 320 td 09.01 - 02.05 110 150 1995 Hatchback BMW 3 Coupe (E46) 320 Cd 11.03 - 07.06 110 150 1995 Coupe BMW 3 Coupe (E46) 330 Cd 03.03 - 07.06 150 204 2993 Coupe BMW 3 Convertible (E46) 320 Cd 02.05 - 12.07 110 150 1995 Convertible BMW 3 Convertible (E46) 330 Cd 08.05 - 12.07 150 204 2993 Convertible BMW 3 Touring (E46) 318 d 10.02 - 03.03 85 115 1951 Estate BMW 3 Touring (E46) 318 d 03.03 - 02.05 85 116 1995 Estate BMW 3 Touring (E46) 320 d 03.00 - 09.01 100 136 1951 Estate BMW 3 Touring (E46) 320 d 09.01 - 02.05 110 150 1995 Estate BMW 3 Touring (E46) 330 d 10.99 - 02.05 135 184 2926 Estate BMW 3 Touring (E46) 330 xd 01.00 - 03.03 135 184 2926 Estate BMW 3 Touring (E46) 330 d 03.03 - 02.05 150 204 2993 Estate BMW 3 Touring (E46) 330 xd 08.02 - 05.05 150 204 2993 Estate BMW 3 (E90) 325 i 01.05 - 10.11 160 218 2497 Saloon Automatic Transmission. BMW 3 (E90) 325 xi 03.05 - 10.11 160 218 2497 Saloon Automatic Transmission. BMW 3 (E90) 325 i 03.07 - 12.11 160 218 2996 Saloon Automatic Transmission. BMW 3 (E90) 325 xi 03.07 - 06.08 160 218 2996 Saloon Automatic Transmission. BMW 3 (E90) 325 i xDrive 06.08 - 10.11 160 218 2996 Saloon Automatic Transmission. BMW 3 (E90) 330 i 12.04 - 08.07 190 258 2996 Saloon Automatic Transmission. BMW 3 (E90) 330 xi 09.05 - 08.07 190 258 2996 Saloon Automatic Transmission. BMW 3 (E90) 330 i 09.07 - 10.11 200 272 2996 Saloon Automatic Transmission. BMW 3 (E90) 330 xi 09.07 - 08.08 200 272 2996 Saloon Automatic Transmission. BMW 3 (E90) 330 i xDrive 09.08 - 10.11 200 272 2996 Saloon Automatic Transmission. BMW 3 (E90) 335 i 03.06 - 12.11 225 306 2979 Saloon BMW 3 (E90) 335 xi 09.06 - 06.08 225 306 2979 Saloon BMW 3 (E90) 335 i xDrive 05.08 - 10.11 225 306 2979 Saloon BMW 3 (E90) 316 d 07.09 - 12.11 85 116 1995 Saloon BMW 3 (E90) 318 d 03.05 - 08.07 90 122 1995 Saloon BMW 3 (E90) 318 d 02.07 - 03.10 100 136 1995 Saloon BMW 3 (E90) 318 d 02.07 - 10.11 105 143 1995 Saloon BMW 3 (E90) 320 d 12.04 - 09.07 110 150 1995 Saloon BMW 3 (E90) 320 d 12.04 - 12.11 120 163 1995 Saloon BMW 3 (E90) 320 d xDrive 09.08 - 10.11 120 163 1995 Saloon BMW 3 (E90) 320 d 09.07 - 03.10 130 177 1995 Saloon BMW 3 (E90) 320 xd 09.07 - 12.11 130 177 1995 Saloon BMW 3 (E90) 320 d xDrive 09.08 - 02.10 130 177 1995 Saloon BMW 3 (E90) 320 d 03.10 - 12.11 135 184 1995 Saloon BMW 3 (E90) 320 d xDrive 03.10 - 10.11 135 184 1995 Saloon BMW 3 (E90) 325 d 09.06 - 02.10 145 197 2993 Saloon BMW 3 (E90) 325 d 03.10 - 10.11 150 204 2993 Saloon BMW 3 (E90) 330 d 09.05 - 09.08 170 231 2993 Saloon BMW 3 (E90) 330 xd 09.05 - 08.08 170 231 2993 Saloon BMW 3 (E90) 330 d 09.08 - 12.11 180 245 2993 Saloon BMW 3 (E90) 330 d xDrive 09.08 - 10.11 180 245 2993 Saloon BMW 3 (E90) 335 d 09.06 - 12.11 210 286 2993 Saloon BMW 3 Touring (E91) 323 i 04.06 - 06.07 130 177 2497 Estate BMW 3 Touring (E91) 323 i 09.06 - 07.08 140 190 2497 Estate BMW 3 Touring (E91) 325 i 12.04 - 12.10 160 218 2497 Estate Automatic Transmission. BMW 3 Touring (E91) 325 xi 08.05 - 08.11 160 218 2497 Estate Automatic Transmission. BMW 3 Touring (E91) 325 i 09.07 - 06.12 160 218 2996 Estate Automatic Transmission. BMW 3 Touring (E91) 325 xi 09.07 - 06.12 160 218 2996 Estate Automatic Transmission. BMW 3 Touring (E91) 325 i xDrive 09.07 - 06.12 160 218 2996 Estate Automatic Transmission. BMW 3 Touring (E91) 330 i 08.05 - 08.07 190 258 2996 Estate Automatic Transmission. BMW 3 Touring (E91) 330 xi 09.05 - 08.07 190 258 2996 Estate Automatic Transmission. BMW 3 Touring (E91) 330 i 09.07 - 06.12 200 272 2996 Estate Automatic Transmission. BMW 3 Touring (E91) 330 xi 09.07 - 06.12 200 272 2996 Estate Automatic Transmission. BMW 3 Touring (E91) 330 i xDrive 09.07 - 06.12 200 272 2996 Estate Automatic Transmission. BMW 3 Touring (E91) 335 i 03.06 - 05.12 225 306 2979 Estate BMW 3 Touring (E91) 335 xi 09.06 - 08.08 225 306 2979 Estate BMW 3 Touring (E91) 335 i xDrive 05.08 - 05.12 225 306 2979 Estate BMW 3 Touring (E91) 316 d 09.09 - 06.12 85 116 1995 Estate BMW 3 Touring (E91) 318 d 09.05 - 08.07 90 122 1995 Estate BMW 3 Touring (E91) 318 d 07.07 - 06.12 100 136 1995 Estate BMW 3 Touring (E91) 318 d 09.07 - 06.12 105 143 1995 Estate BMW 3 Touring (E91) 320 d 12.04 - 08.07 110 150 1995 Estate BMW 3 Touring (E91) 320 d 12.04 - 08.07 120 163 1995 Estate BMW 3 Touring (E91) 320 d ed 10.10 - 05.12 120 163 1995 Estate BMW 3 Touring (E91) 320 d xDrive 07.09 - 06.12 120 163 1995 Estate BMW 3 Touring (E91) 320 d 02.07 - 02.10 130 177 1995 Estate BMW 3 Touring (E91) 320 d xDrive 02.08 - 02.10 130 177 1995 Estate BMW 3 Touring (E91) 320 d 03.10 - 05.12 135 184 1995 Estate BMW 3 Touring (E91) 320 d xDrive 03.10 - 05.12 135 184 1995 Estate BMW 3 Touring (E91) 320 d 02.07 - 02.10 145 197 1995 Estate BMW 3 Touring (E91) 320 d xDrive 02.08 - 02.10 145 197 1995 Estate BMW 3 Touring (E91) 320 d 03.10 - 05.12 147 200 1995 Estate BMW 3 Touring (E91) 320 d xDrive 03.10 - 05.12 147 200 1995 Estate BMW 3 Touring (E91) 325 d 09.06 - 06.12 145 197 2993 Estate BMW 3 Touring (E91) 325 d 02.10 - 06.12 150 204 2993 Estate BMW 3 Touring (E91) 330 d 12.04 - 08.08 170 231 2993 Estate BMW 3 Touring (E91) 330 xd 09.05 - 06.12 170 231 2993 Estate BMW 3 Touring (E91) 330 d 02.08 - 05.12 180 245 2993 Estate BMW 3 Touring (E91) 330 d xDrive 01.09 - 06.12 180 245 2993 Estate BMW 3 Touring (E91) 335 d 09.06 - 06.12 210 286 2993 Estate BMW 3 Coupe (E92) 325 xi 09.06 - 02.10 160 218 2497 Coupe Automatic Transmission. BMW 3 Coupe (E92) 325 i 03.07 - 06.13 160 218 2996 Coupe Automatic Transmission. BMW 3 Coupe (E92) 325 xi 09.07 - 02.10 160 218 2996 Coupe Automatic Transmission. BMW 3 Coupe (E92) 325 i xDrive 09.08 - 12.13 160 218 2996 Coupe Automatic Transmission. BMW 3 Coupe (E92) 330 xi 09.06 - 08.07 200 272 2996 Coupe Automatic Transmission. BMW 3 Coupe (E92) 330 i 03.07 - 06.13 200 272 2996 Coupe Automatic Transmission. BMW 3 Coupe (E92) 330 xi 03.07 - 02.10 200 272 2996 Coupe Automatic Transmission. BMW 3 Coupe (E92) 330 i xDrive 03.10 - 06.13 200 272 2996 Coupe Automatic Transmission. BMW 3 Coupe (E92) 335 i 11.05 - 06.13 225 306 2979 Coupe BMW 3 Coupe (E92) 335 xi 03.07 - 02.10 225 306 2979 Coupe BMW 3 Coupe (E92) 335 i xDrive 11.08 - 12.13 225 306 2979 Coupe BMW 3 Coupe (E92) 320 d 09.06 - 02.10 130 177 1995 Coupe BMW 3 Coupe (E92) 320 xd 03.08 - 02.10 130 177 1995 Coupe BMW 3 Coupe (E92) 320 d xDrive 09.09 - 02.10 130 177 1995 Coupe BMW 3 Coupe (E92) 320 d 03.10 - 06.13 135 184 1995 Coupe BMW 3 Coupe (E92) 320 d xDrive 03.10 - 06.13 135 184 1995 Coupe BMW 3 Coupe (E92) 320 d 09.06 - 02.10 145 197 1995 Coupe BMW 3 Coupe (E92) 320 xd 03.08 - 02.10 145 197 1995 Coupe BMW 3 Coupe (E92) 320 d 03.10 - 06.13 147 200 1995 Coupe BMW 3 Coupe (E92) 320 d xDrive 03.10 - 06.13 147 200 1995 Coupe BMW 3 Coupe (E92) 325 d 02.07 - 02.10 145 197 2993 Coupe BMW 3 Coupe (E92) 325 d 09.09 - 12.13 150 204 2993 Coupe BMW 3 Coupe (E92) 330 d 03.06 - 08.08 170 231 2993 Coupe BMW 3 Coupe (E92) 330 xd 03.06 - 08.08 170 231 2993 Coupe BMW 3 Coupe (E92) 330 d 01.09 - 12.13 180 245 2993 Coupe BMW 3 Coupe (E92) 330 xd 03.08 - 02.10 180 245 2993 Coupe BMW 3 Coupe (E92) 330 d xDrive 02.10 - 06.13 180 245 2993 Coupe BMW 3 Coupe (E92) 335 d 03.06 - 03.13 210 286 2993 Coupe BMW 3 Convertible (E93) 323 i 03.07 - 09.11 140 190 2497 Convertible BMW 3 Convertible (E93) 325 i 03.10 - 09.13 150 204 2497 Convertible BMW 3 Convertible (E93) 325 i 03.07 - 12.13 160 218 2497 Convertible Automatic Transmission. BMW 3 Convertible (E93) 325 i 03.07 - 12.13 160 218 2996 Convertible Automatic Transmission. BMW 3 Convertible (E93) 330 i 03.07 - 12.13 200 272 2996 Convertible Automatic Transmission. BMW 3 Convertible (E93) 330 i 03.07 - 12.13 200 272 2996 Convertible BMW 3 Convertible (E93) 335 i 05.06 - 10.13 225 306 2979 Convertible BMW 3 Convertible (E93) 320 d 09.07 - 02.10 130 177 1995 Convertible BMW 3 Convertible (E93) 320 d 03.10 - 10.13 135 184 1995 Convertible BMW 3 Convertible (E93) 320 d 09.07 - 02.10 145 197 1995 Convertible BMW 3 Convertible (E93) 320 d 03.10 - 10.13 147 200 1995 Convertible BMW 3 Convertible (E93) 325 d 03.07 - 12.10 145 197 2993 Convertible BMW 3 Convertible (E93) 325 d 09.09 - 09.13 150 204 2993 Convertible BMW 3 Convertible (E93) 330 d 03.07 - 12.13 170 231 2993 Convertible BMW 3 Convertible (E93) 330 d 01.09 - 12.13 180 245 2993 Convertible BMW 3 (F30, F80) 320 i xDrive 05.11 - 06.15 135 184 1997 Saloon BMW 3 (F30, F80) 320 i 09.14 - 135 184 1998 Saloon BMW 3 (F30, F80) 320 i xDrive 09.14 - 135 184 1998 Saloon BMW 3 (F30, F80) 328 i xDrive 05.11 - 07.16 180 245 1997 Saloon Engine Code: N20. BMW 3 (F30, F80) 330 i 09.14 - 185 252 1998 Saloon Engine Code: B48. BMW 3 (F30, F80) 330 i xDrive 10.14 - 185 252 1998 Saloon BMW 3 (F30, F80) 330 e 02.15 - 135 184 1998 Saloon BMW 3 (F30, F80) 330 e 02.15 - 185 252 1998 Saloon BMW 3 (F30, F80) 335 i 04.11 - 07.15 225 306 2979 Saloon BMW 3 (F30, F80) 335 i xDrive 05.11 - 07.15 225 306 2979 Saloon BMW 3 (F30, F80) 335 i 04.11 - 07.13 240 326 2979 Saloon BMW 3 (F30, F80) 335 i xDrive 04.11 - 07.13 240 326 2979 Saloon BMW 3 (F30, F80) 335 i 07.13 - 250 340 2979 Saloon BMW 3 (F30, F80) 335 i xDrive 07.13 - 250 340 2979 Saloon BMW 3 (F30, F80) ActiveHybrid 11.11 - 05.15 225 306 2979 Saloon BMW 3 (F30, F80) ActiveHybrid 11.11 - 05.15 250 340 2979 Saloon BMW 3 (F30, F80) M3 04.12 - 317 431 2979 Saloon BMW 3 (F30, F80) 316 d 05.11 - 85 116 1995 Saloon BMW 3 (F30, F80) 318 d 05.11 - 06.15 105 143 1995 Saloon BMW 3 (F30, F80) 318 d xDrive 11.12 - 05.15 105 143 1995 Saloon BMW 3 (F30, F80) 320 d Efficient Dynamics 04.11 - 120 163 1995 Saloon BMW 3 (F30, F80) 320 d 03.11 - 03.16 135 184 1995 Saloon BMW 3 (F30, F80) 320 d xDrive 10.11 - 07.15 135 184 1995 Saloon BMW 3 (F30, F80) 320 d 03.11 - 03.16 147 200 1995 Saloon BMW 3 (F30, F80) 320 d xDrive 05.11 - 06.15 147 200 1995 Saloon BMW 3 (F30, F80) 325 d 07.12 - 02.16 160 218 1995 Saloon BMW 3 (F30, F80) 330 d 01.12 - 190 258 2993 Saloon BMW 3 (F30, F80) 330 d xDrive 01.12 - 190 258 2993 Saloon BMW 3 (F30, F80) 330 d 01.12 - 210 286 2993 Saloon BMW 3 (F30, F80) 330 d xDrive 01.12 - 210 286 2993 Saloon BMW 3 (F30, F80) 335 d xDrive 11.12 - 230 313 2993 Saloon BMW 3 Touring (F31) 320 i xDrive 01.12 - 06.15 135 184 1997 Estate BMW 3 Touring (F31) 320 i 10.14 - 135 184 1998 Estate BMW 3 Touring (F31) 320 i xDrive 09.14 - 135 184 1998 Estate BMW 3 Touring (F31) 328 i xDrive 06.12 - 06.16 180 245 1997 Estate BMW 3 Touring (F31) 330 i 09.14 - 185 252 1998 Estate BMW 3 Touring (F31) 330 i xDrive 10.14 - 185 252 1998 Estate BMW 3 Touring (F31) 335 i 07.12 - 06.15 225 306 2979 Estate BMW 3 Touring (F31) 335 i xDrive 07.12 - 06.15 225 306 2979 Estate BMW 3 Touring (F31) 335 i 07.12 - 07.13 240 326 2979 Estate BMW 3 Touring (F31) 335 i xDrive 07.12 - 07.13 240 326 2979 Estate BMW 3 Touring (F31) 335 i 07.13 - 06.15 250 340 2979 Estate BMW 3 Touring (F31) 335 i xDrive 07.13 - 06.15 250 340 2979 Estate BMW 3 Touring (F31) 316 d 02.12 - 85 116 1995 Estate BMW 3 Touring (F31) 318 d 07.11 - 06.15 105 143 1995 Estate BMW 3 Touring (F31) 318 d xDrive 01.13 - 05.15 105 143 1995 Estate BMW 3 Touring (F31) 320 d 07.11 - 120 163 1995 Estate BMW 3 Touring (F31) 320 d 07.11 - 02.16 135 184 1995 Estate BMW 3 Touring (F31) 320 d xDrive 01.12 - 06.15 135 184 1995 Estate BMW 3 Touring (F31) 320 d 07.11 - 02.16 147 200 1995 Estate BMW 3 Touring (F31) 320 d xDrive 01.12 - 06.15 147 200 1995 Estate BMW 3 Touring (F31) 325 d 09.12 - 02.16 160 218 1995 Estate BMW 3 Touring (F31) 330 d 01.12 - 190 258 2993 Estate BMW 3 Touring (F31) 330 d xDrive 06.12 - 190 258 2993 Estate BMW 3 Touring (F31) 330 d 01.12 - 210 286 2993 Estate BMW 3 Touring (F31) 330 d xDrive 06.12 - 210 286 2993 Estate BMW 3 Gran Turismo (F34) 320 i xDrive 11.12 - 06.16 135 184 1997 Hatchback BMW 3 Gran Turismo (F34) 328 i xDrive 03.13 - 07.16 180 245 1997 Hatchback Engine Code: N20. BMW 3 Gran Turismo (F34) 335 i 03.13 - 225 306 2979 Hatchback BMW 3 Gran Turismo (F34) 335 i xDrive 03.13 - 225 306 2979 Hatchback BMW 3 Gran Turismo (F34) 335 i 03.13 - 03.14 240 326 2979 Hatchback BMW 3 Gran Turismo (F34) 335 i xDrive 03.13 - 03.14 240 326 2979 Hatchback BMW 3 Gran Turismo (F34) 335 i 07.13 - 250 340 2979 Hatchback BMW 3 Gran Turismo (F34) 335 i xDrive 03.14 - 250 340 2979 Hatchback BMW 3 Gran Turismo (F34) 318 d 03.13 - 105 143 1995 Hatchback BMW 3 Gran Turismo (F34) 318 d 07.15 - 110 150 1995 Hatchback BMW 3 Gran Turismo (F34) 320 d 03.13 - 07.15 135 184 1995 Hatchback BMW 3 Gran Turismo (F34) 320 d xDrive 03.13 - 07.15 135 184 1995 Hatchback BMW 3 Gran Turismo (F34) 320 d 07.15 - 140 190 1995 Hatchback BMW 3 Gran Turismo (F34) 320 d xDrive 07.15 - 140 190 1995 Hatchback BMW 3 Gran Turismo (F34) 320 d 05.13 - 07.15 147 200 1995 Hatchback BMW 3 Gran Turismo (F34) 320 d xDrive 05.13 - 07.15 147 200 1995 Hatchback BMW 3 Gran Turismo (F34) 325 d 03.13 - 160 218 1995 Hatchback BMW 3 Gran Turismo (F34) 325 d 07.16 - 165 224 1995 Hatchback BMW 3 Gran Turismo (F34) 330 d 01.14 - 190 258 2993 Hatchback BMW 3 Gran Turismo (F34) 330 d xDrive 01.14 - 190 258 2993 Hatchback BMW 3 Gran Turismo (F34) 330 d 01.14 - 210 286 2993 Hatchback BMW 3 Gran Turismo (F34) 330 d xDrive 01.14 - 210 286 2993 Hatchback BMW 3 Gran Turismo (F34) 335 d xDrive 01.14 - 230 313 2993 Hatchback BMW 5 (E34) 524 td 03.88 - 09.95 85 115 2443 Saloon BMW 5 (E34) 525 td 04.93 - 09.95 85 115 2497 Saloon BMW 5 (E34) 525 tds 09.91 - 09.95 105 143 2503 Saloon BMW 5 Touring (E34) 525 td 03.93 - 01.97 85 115 2497 Estate BMW 5 Touring (E34) 525 tds 12.91 - 01.97 105 143 2503 Estate BMW 5 (E39) 520 d 02.00 - 06.03 100 136 1951 Saloon BMW 5 (E39) 525 td 01.97 - 06.03 85 116 2497 Saloon BMW 5 (E39) 525 d 02.00 - 06.03 120 163 2497 Saloon BMW 5 (E39) 525 tds 01.96 - 06.03 105 143 2503 Saloon BMW 5 (E39) 530 d 08.98 - 09.00 135 184 2926 Saloon BMW 5 (E39) 530 d 09.98 - 06.03 142 193 2926 Saloon BMW 5 Touring (E39) 520 d 02.00 - 09.03 100 136 1951 Estate BMW 5 Touring (E39) 525 d 02.00 - 05.04 120 163 2497 Estate BMW 5 Touring (E39) 525 tds 03.97 - 05.04 105 143 2497 Estate BMW 5 Touring (E39) 530 d 08.98 - 09.00 135 184 2926 Estate BMW 5 Touring (E39) 530 d 09.00 - 05.04 142 193 2926 Estate BMW 5 (E60) 520 i 04.06 - 12.09 115 156 1995 Saloon BMW 5 (E60) 520 i 09.07 - 03.10 125 170 1995 Saloon BMW 5 (E60) 520 i 07.03 - 03.10 125 170 2171 Saloon Model year from: 09.04. BMW 5 (E60) 523 i 10.04 - 02.07 130 177 2497 Saloon BMW 5 (E60) 523 i 01.07 - 03.10 140 190 2497 Saloon BMW 5 (E60) 523 i 01.07 - 03.10 140 190 2497 Saloon BMW 5 (E60) 525 i 09.03 - 03.10 141 192 2494 Saloon Model year from: 09.04. BMW 5 (E60) 525 i 10.04 - 12.09 160 218 2497 Saloon BMW 5 (E60) 525 xi 07.05 - 03.10 160 218 2497 Saloon BMW 5 (E60) 525 i 01.07 - 03.10 160 218 2996 Saloon BMW 5 (E60) 525 xi 01.07 - 03.10 160 218 2996 Saloon BMW 5 (E60) 530 i 12.01 - 02.05 170 231 2979 Saloon Model year from: 09.04. BMW 5 (E60) 530 i 09.04 - 02.07 190 258 2996 Saloon BMW 5 (E60) 530 i 09.06 - 12.09 200 272 2996 Saloon BMW 5 (E60) 530 i 09.06 - 12.09 200 272 2996 Saloon BMW 5 (E60) 530 xi 09.04 - 02.07 190 258 2996 Saloon BMW 5 (E60) 530 i xDrive 09.08 - 12.09 200 272 2996 Saloon BMW 5 (E60) 520 d 02.05 - 02.08 110 150 1995 Saloon BMW 5 (E60) 520 d 02.05 - 02.08 120 163 1995 Saloon BMW 5 (E60) 520 d 04.06 - 12.09 130 177 1995 Saloon BMW 5 (E60) 525 d 06.04 - 03.10 130 177 2497 Saloon BMW 5 (E60) 525 d 01.07 - 03.10 145 197 2993 Saloon BMW 5 (E60) 525 xd 11.06 - 08.07 145 197 2993 Saloon BMW 5 (E60) 525 d xDrive 09.07 - 12.09 145 197 2993 Saloon BMW 5 (E60) 530 d 09.02 - 09.05 160 218 2993 Saloon BMW 5 (E60) 530 d 04.05 - 02.07 170 231 2993 Saloon BMW 5 (E60) 530 xd 02.05 - 02.07 170 231 2993 Saloon BMW 5 (E60) 530 d 02.07 - 12.09 173 235 2993 Saloon BMW 5 (E60) 530 xd 03.07 - 08.07 173 235 2993 Saloon BMW 5 (E60) 530 d xDrive 09.07 - 12.09 173 235 2993 Saloon BMW 5 (E60) 535 d 09.04 - 03.10 200 272 2993 Saloon BMW 5 (E60) 535 d 01.07 - 03.10 210 286 2993 Saloon BMW 5 Touring (E61) 520 i 07.07 - 08.10 120 163 1995 Estate BMW 5 Touring (E61) 520 i 09.07 - 12.10 125 170 1995 Estate BMW 5 Touring (E61) 523 i 10.04 - 02.07 130 177 2497 Estate BMW 5 Touring (E61) 523 i 01.07 - 12.10 140 190 2497 Estate BMW 5 Touring (E61) 525 i 06.04 - 12.10 141 192 2494 Estate Model year from: 09.04. BMW 5 Touring (E61) 525 i 10.04 - 03.10 160 218 2497 Estate BMW 5 Touring (E61) 525 xi 07.05 - 12.10 160 218 2497 Estate BMW 5 Touring (E61) 525 i 01.07 - 12.10 160 218 2996 Estate BMW 5 Touring (E61) 525 xi 01.07 - 12.10 160 218 2996 Estate BMW 5 Touring (E61) 525 i xDrive 09.08 - 12.10 160 218 2996 Estate BMW 5 Touring (E61) 530 i 09.04 - 02.07 190 258 2996 Estate BMW 5 Touring (E61) 530 xi 04.05 - 02.07 190 258 2996 Estate BMW 5 Touring (E61) 530 i 09.06 - 03.10 200 272 2996 Estate BMW 5 Touring (E61) 530 i 01.07 - 12.10 200 272 2996 Estate BMW 5 Touring (E61) 530 i xDrive 09.08 - 05.10 200 272 2996 Estate BMW 5 Touring (E61) 520 d 04.05 - 02.08 120 163 1995 Estate BMW 5 Touring (E61) 520 d 03.07 - 05.10 130 177 1995 Estate BMW 5 Touring (E61) 525 d 03.04 - 03.07 120 163 2497 Estate BMW 5 Touring (E61) 525 d 03.04 - 03.07 130 177 2497 Estate BMW 5 Touring (E61) 525 d 03.07 - 05.10 145 197 2993 Estate BMW 5 Touring (E61) 525 xd 09.07 - 09.08 145 197 2993 Estate BMW 5 Touring (E61) 530 d 03.04 - 09.05 160 218 2993 Estate BMW 5 Touring (E61) 530 d 02.05 - 02.07 170 231 2993 Estate BMW 5 Touring (E61) 530 xd 02.05 - 02.07 170 231 2993 Estate BMW 5 Touring (E61) 530 d 02.07 - 05.10 173 235 2993 Estate BMW 5 Touring (E61) 530 xd 01.07 - 08.07 173 235 2993 Estate BMW 5 Touring (E61) 535 d 09.04 - 12.10 200 272 2993 Estate BMW 5 Touring (E61) 535 d 01.07 - 12.10 210 286 2993 Estate BMW 5 Gran Turismo (F07) 535 i 01.09 - 02.17 225 306 2979 Hatchback BMW 5 Gran Turismo (F07) 535 i xDrive 01.10 - 02.17 225 306 2979 Hatchback BMW 5 Gran Turismo (F07) 530 d 09.10 - 06.12 155 211 2993 Hatchback BMW 5 Gran Turismo (F07) 530 d 08.09 - 06.12 180 245 2993 Hatchback BMW 5 Gran Turismo (F07) 530 d xDrive 06.10 - 06.12 180 245 2993 Hatchback BMW 5 Gran Turismo (F07) 530 d 07.12 - 02.17 190 258 2993 Hatchback BMW 5 Gran Turismo (F07) 535 d 03.10 - 06.12 220 299 2993 Hatchback BMW 5 Gran Turismo (F07) 535 d xDrive 03.10 - 06.12 220 299 2993 Hatchback BMW 5 (F10) 523 i 06.09 - 08.11 150 204 2996 Saloon BMW 5 (F10) 528 i xDrive 10.10 - 10.16 180 245 1997 Saloon BMW 5 (F10) 528 i 01.09 - 08.11 190 258 2996 Saloon BMW 5 (F10) 530 i 06.09 - 06.13 190 258 2996 Saloon BMW 5 (F10) 530 i 05.11 - 06.13 200 272 2996 Saloon BMW 5 (F10) 535 i 01.09 - 10.16 225 306 2979 Saloon BMW 5 (F10) 535 i xDrive 03.10 - 10.16 225 306 2979 Saloon BMW 5 (F10) 535 i 07.13 - 10.16 240 326 2979 Saloon BMW 5 (F10) 535 i xDrive 07.13 - 10.16 240 326 2979 Saloon BMW 5 (F10) ActiveHybrid 09.10 - 08.16 225 306 2979 Saloon BMW 5 (F10) ActiveHybrid 09.10 - 08.16 250 340 2979 Saloon BMW 5 (F10) M5 10.10 - 10.16 412 560 4395 Saloon BMW 5 (F10) M5 Competition 02.13 - 10.16 423 575 4395 Saloon BMW 5 (F10) M5 Edition 30 07.14 - 10.16 441 600 4395 Saloon BMW 5 (F10) 518 d 02.13 - 06.14 105 143 1995 Saloon BMW 5 (F10) 520 d 03.10 - 06.14 135 184 1995 Saloon BMW 5 (F10) 520 d xDrive 01.13 - 06.14 135 184 1995 Saloon BMW 5 (F10) 520 d 01.13 - 06.14 147 200 1995 Saloon BMW 5 (F10) 520 d xDrive 01.13 - 06.14 147 200 1995 Saloon BMW 5 (F10) 525 d 01.11 - 10.16 155 211 1995 Saloon BMW 5 (F10) 525 d xDrive 01.11 - 10.16 155 211 1995 Saloon BMW 5 (F10) 525 d 03.10 - 08.11 150 204 2993 Saloon BMW 5 (F10) 530 d 01.09 - 08.11 180 245 2993 Saloon BMW 5 (F10) 530 d 09.10 - 10.16 210 286 2993 Saloon BMW 5 (F10) 530 d xDrive 09.10 - 10.16 210 286 2993 Saloon BMW 5 (F10) 535 d 03.10 - 08.11 220 299 2993 Saloon BMW 5 (F10) M 550 d xDrive 07.11 - 10.16 280 381 2993 Saloon BMW 5 Touring (F11) 523 i 11.09 - 08.11 150 204 2996 Estate BMW 5 Touring (F11) 528 i 10.10 - 180 245 1997 Estate BMW 5 Touring (F11) 528 i xDrive 03.11 - 180 245 1997 Estate BMW 5 Touring (F11) 528 i 11.09 - 08.11 190 258 2996 Estate BMW 5 Touring (F11) 530 i 03.10 - 05.13 190 258 2996 Estate BMW 5 Touring (F11) 530 i 07.11 - 06.13 200 272 2996 Estate BMW 5 Touring (F11) 535 i 11.09 - 225 306 2979 Estate BMW 5 Touring (F11) 535 i xDrive 07.10 - 225 306 2979 Estate BMW 5 Touring (F11) 535 i 01.13 - 240 326 2979 Estate BMW 5 Touring (F11) 535 i xDrive 07.13 - 240 326 2979 Estate BMW 5 Touring (F11) 518 d 10.12 - 07.14 105 143 1995 Estate BMW 5 Touring (F11) 520 d 11.09 - 10.16 135 184 1995 Estate BMW 5 Touring (F11) 520 d xDrive 02.13 - 07.14 135 184 1995 Estate BMW 5 Touring (F11) 520 d 11.09 - 10.16 147 200 1995 Estate BMW 5 Touring (F11) 520 d xDrive 02.13 - 07.14 147 200 1995 Estate BMW 5 Touring (F11) 525 d 03.11 - 160 218 1995 Estate BMW 5 Touring (F11) 525 d xDrive 02.11 - 160 218 1995 Estate BMW 5 Touring (F11) 525 d 11.09 - 08.11 150 204 2993 Estate BMW 5 Touring (F11) 530 d 11.09 - 08.11 180 245 2993 Estate BMW 5 Touring (F11) 530 d 02.11 - 190 258 2993 Estate BMW 5 Touring (F11) 530 d xDrive 07.10 - 190 258 2993 Estate BMW 5 Touring (F11) 530 d 09.11 - 210 286 2993 Estate BMW 5 Touring (F11) 530 d xDrive 09.11 - 210 286 2993 Estate BMW 5 Touring (F11) 535 d 03.10 - 08.11 220 299 2993 Estate BMW 5 Touring (F11) 535 d 03.11 - 230 313 2993 Estate BMW 5 Touring (F11) 535 d xDrive 01.11 - 230 313 2993 Estate BMW 5 Touring (F11) M 550 d xDrive 10.10 - 280 381 2993 Estate BMW 5 (G30, F90) 520 i 07.17 - 120 163 1998 Saloon BMW 5 (G30, F90) 520 i 07.17 - 135 184 1998 Saloon BMW 5 (G30, F90) 530 e iPerformance 03.17 - 135 184 1998 Saloon BMW 5 (G30, F90) 530 i 09.16 - 185 252 1998 Saloon BMW 5 (G30, F90) 530 i xDrive 09.16 - 185 252 1998 Saloon BMW 5 (G30, F90) 540 i 09.16 - 250 340 2998 Saloon BMW 5 (G30, F90) 540 i xDrive 09.16 - 250 340 2998 Saloon BMW 5 (G30, F90) 540 i 09.16 - 265 360 2998 Saloon BMW 5 (G30, F90) 540 i xDrive 09.16 - 265 360 2998 Saloon BMW 5 (G30, F90) M 550 i xDrive 03.17 - 340 462 4395 Saloon BMW 5 (G30, F90) 520 d 09.16 - 140 190 1995 Saloon BMW 5 (G30, F90) 520 d xDrive 09.16 - 140 190 1995 Saloon BMW 5 (G30, F90) 525 d 07.17 - 170 231 1995 Saloon BMW 5 (G30, F90) 530 d 09.16 - 195 265 2993 Saloon BMW 5 (G30, F90) 530 d xDrive 09.16 - 195 265 2993 Saloon BMW 5 (G30, F90) 540 d xDrive 07.17 - 235 320 2993 Saloon BMW 5 (G30, F90) M 550 d xDrive 06.17 - 294 400 2993 Saloon BMW 5 Touring (G31) 520 i 07.17 - 135 184 1998 Estate BMW 5 Touring (G31) 530 i 03.17 - 185 252 1998 Estate BMW 5 Touring (G31) 530 i xDrive 07.17 - 185 252 1998 Estate BMW 5 Touring (G31) 540 i xDrive 03.17 - 250 340 2998 Estate BMW 5 Touring (G31) 540 i xDrive 03.17 - 265 360 2998 Estate BMW 5 Touring (G31) 520 d 03.17 - 140 190 1995 Estate BMW 5 Touring (G31) 520 d xDrive 07.17 - 140 190 1995 Estate BMW 5 Touring (G31) 525 d 07.17 - 170 231 1995 Estate BMW 5 Touring (G31) 530 d 03.17 - 195 265 2993 Estate BMW 5 Touring (G31) 530 d xDrive 03.17 - 195 265 2993 Estate BMW 5 Touring (G31) 540 d xDrive 07.17 - 235 320 2993 Estate BMW 5 Touring (G31) M 550 d xDrive 07.17 - 294 400 2993 Estate BMW 6 (E63) 630 i 02.04 - 07.07 190 258 2996 Coupe BMW 6 (E63) 630 i 07.07 - 07.10 200 272 2996 Coupe BMW 6 (E63) 635 d 07.07 - 07.10 210 286 2993 Coupe BMW 6 Convertible (E64) 630 i 03.04 - 07.07 190 258 2996 Convertible BMW 6 Convertible (E64) 630 i 07.07 - 07.10 200 272 2996 Convertible BMW 6 Convertible (E64) 635 d 07.07 - 07.10 210 286 2993 Convertible BMW 6 Convertible (F12) 640 i 03.11 - 235 320 2979 Convertible BMW 6 Convertible (F12) 640 d 09.11 - 230 313 2993 Convertible BMW 6 Coupe (F13) 640 i 11.10 - 235 320 2979 Coupe BMW 6 Coupe (F13) 640 d 11.10 - 230 313 2993 Coupe BMW 6 Gran Coupe (F06) 640 i 09.11 - 235 320 2979 Coupe BMW 7 (E38) 725 tds 04.96 - 11.01 105 143 2503 Saloon BMW 7 (E38) 730 d 08.98 - 04.00 135 184 2926 Saloon BMW 7 (E38) 730 d 04.00 - 11.01 142 193 2926 Saloon BMW 7 (E65, E66, E67) 730 i, Li 03.05 - 07.08 190 258 2996 Saloon BMW 7 (E65, E66, E67) 730 d 06.02 - 02.05 160 218 2993 Saloon BMW 7 (E65, E66, E67) 730 Ld 07.05 - 08.08 170 231 2993 Saloon BMW 7 (E65, E66, E67) 740 d 10.02 - 02.05 190 258 3901 Saloon BMW 7 (E65, E66, E67) 745 d 07.05 - 07.08 242 329 4423 Saloon BMW 7 (F01, F02, F03, F04) 730 i, Li 06.08 - 12.15 190 258 2996 Saloon BMW 7 (F01, F02, F03, F04) 740 i, Li 07.12 - 12.15 235 320 2979 Saloon BMW 7 (F01, F02, F03, F04) 740 i 10.08 - 12.15 240 326 2979 Saloon BMW 7 (F01, F02, F03, F04) ActiveHybrid 05.11 - 05.15 235 320 2979 Saloon BMW 7 (F01, F02, F03, F04) ActiveHybrid 05.11 - 05.15 260 354 2979 Saloon BMW 7 (F01, F02, F03, F04) 730 d xDrive 11.11 - 05.15 155 211 2993 Saloon BMW 7 (F01, F02, F03, F04) 730 d 02.08 - 07.12 180 245 2993 Saloon BMW 7 (F01, F02, F03, F04) 730 d 07.12 - 05.15 190 258 2993 Saloon BMW 7 (F01, F02, F03, F04) 740 d 09.09 - 12.15 225 306 2993 Saloon BMW 7 (F01, F02, F03, F04) 740 d xDrive 09.09 - 12.15 225 306 2993 Saloon BMW 7 (F01, F02, F03, F04) 740 d 07.12 - 12.15 230 313 2993 Saloon BMW 7 (F01, F02, F03, F04) 740 d xDrive 07.12 - 12.15 230 313 2993 Saloon BMW 7 (F01, F02, F03, F04) 750 d xDrive 07.12 - 12.15 280 381 2993 Saloon BMW 7 (G11, G12) 740 e, Le 04.16 - 190 258 1998 Saloon BMW 7 (G11, G12) 740 e, Le xDrive 04.16 - 190 258 1998 Saloon BMW 7 (G11, G12) 740 i, Li 09.15 - 240 326 2998 Saloon BMW 7 (G11, G12) 740 i, Li xDrive 03.16 - 240 326 2998 Saloon BMW 7 (G11, G12) 730 d 09.15 - 195 265 2993 Saloon BMW 7 (G11, G12) 730 d, Ld xDrive 09.15 - 195 265 2993 Saloon BMW 7 (G11, G12) 740 d, Ld xDrive 11.15 - 235 320 2993 Saloon BMW 7 (G11, G12) 750 d, Ld xDrive 07.16 - 294 400 2993 Saloon BMW i8 (I12) hybrid 03.14 - 170 231 1499 Coupe BMW X1 (E84) xDrive 20 i 09.11 - 06.15 135 184 1997 Estate BMW X1 (E84) xDrive 25 i 01.10 - 06.15 160 218 2996 Estate BMW X1 (E84) xDrive 28 i 04.11 - 06.15 180 245 1997 Estate BMW X1 (E84) xDrive 28 i 10.09 - 06.15 190 258 2996 Estate BMW X1 (E84) sDrive 18 d 10.09 - 06.15 105 143 1995 Estate BMW X1 (E84) xDrive 18 d 10.09 - 06.15 105 143 1995 Estate BMW X1 (E84) sDrive 20 d 10.09 - 06.15 130 177 1995 Estate BMW X1 (E84) xDrive 20 d 10.09 - 06.15 130 177 1995 Estate BMW X1 (E84) xDrive 23 d 10.09 - 06.15 150 204 1995 Estate BMW X1 (E84) xDrive 25 d 10.09 - 06.15 160 218 1995 Estate BMW X1 (F48) sDrive 18 i 11.14 - 05.17 100 136 1499 Estate BMW X1 (F48) sDrive 18 i 06.17 - 103 140 1499 Estate BMW X1 (F48) xDrive 25 i 11.14 - 170 231 1998 Estate Engine Code: B46. BMW X3 (E83) 2.0 i 07.05 - 08.08 110 150 1995 Closed Off-Road Vehicle BMW X3 (E83) xDrive 20 i 09.08 - 08.11 110 150 1995 Closed Off-Road Vehicle BMW X3 (E83) 2.5 i 01.04 - 08.06 141 192 2494 Closed Off-Road Vehicle BMW X3 (E83) 2.5 si 09.06 - 08.08 160 218 2497 Closed Off-Road Vehicle BMW X3 (E83) xDrive 25 i 09.08 - 12.11 160 218 2497 Closed Off-Road Vehicle BMW X3 (E83) 3.0 i xDrive 01.04 - 08.06 170 231 2979 Closed Off-Road Vehicle BMW X3 (E83) 3.0 si 09.06 - 08.08 200 272 2996 Closed Off-Road Vehicle BMW X3 (E83) xDrive 30 i 09.08 - 12.11 200 272 2996 Closed Off-Road Vehicle BMW X3 (E83) xDrive 18 d 09.08 - 12.11 105 143 1995 Closed Off-Road Vehicle BMW X3 (E83) 2.0 d 11.03 - 08.07 110 150 1995 Closed Off-Road Vehicle BMW X3 (E83) 2.0 d 03.07 - 08.07 130 177 1995 Closed Off-Road Vehicle BMW X3 (E83) xDrive 20 d 09.07 - 08.10 120 163 1995 Closed Off-Road Vehicle BMW X3 (E83) xDrive 20 d 09.07 - 08.10 130 177 1995 Closed Off-Road Vehicle BMW X3 (E83) 3.0 d 01.04 - 08.05 150 204 2993 Closed Off-Road Vehicle BMW X3 (E83) xDrive 30 d 09.08 - 08.10 155 211 2993 Closed Off-Road Vehicle BMW X3 (E83) 3.0 d 09.05 - 08.08 160 218 2993 Closed Off-Road Vehicle BMW X3 (E83) xDrive 30 d 09.08 - 08.10 160 218 2993 Closed Off-Road Vehicle BMW X3 (E83) 3.0 sd 09.06 - 08.08 210 286 2993 Closed Off-Road Vehicle BMW X3 (E83) xDrive 35 d 09.08 - 08.11 210 286 2993 Closed Off-Road Vehicle BMW X3 (F25) xDrive 28 i 04.11 - 190 258 2996 Closed Off-Road Vehicle BMW X3 (F25) xDrive 35 i 09.10 - 225 306 2979 Closed Off-Road Vehicle BMW X3 (F25) sDrive 18 d 02.14 - 110 150 1995 Closed Off-Road Vehicle BMW X3 (F25) xDrive 20 d 09.10 - 135 184 1995 Closed Off-Road Vehicle BMW X3 (F25) xDrive 20 d 02.14 - 140 190 1995 Closed Off-Road Vehicle BMW X3 (F25) xDrive 30 d 05.11 - 190 258 2993 Closed Off-Road Vehicle BMW X4 (F26) xDrive 20 i 04.14 - 03.18 135 184 1997 Closed Off-Road Vehicle BMW X4 (F26) xDrive 28 i 04.14 - 03.18 180 245 1997 Closed Off-Road Vehicle BMW X4 (F26) xDrive 35 i 04.14 - 03.18 225 306 2979 Closed Off-Road Vehicle BMW X4 (F26) M 40 i 12.15 - 03.18 265 360 2979 Closed Off-Road Vehicle BMW X4 (F26) xDrive 20 d 04.14 - 03.18 140 190 1995 Closed Off-Road Vehicle BMW X4 (F26) xDrive 30 d 04.14 - 03.18 190 258 2993 Closed Off-Road Vehicle BMW X4 (F26) xDrive 30 d 04.14 - 03.18 210 286 2993 Closed Off-Road Vehicle BMW X4 (F26) xDrive 35 d 04.14 - 03.18 230 313 2993 Closed Off-Road Vehicle BMW X5 (E53) 3.0 d 05.01 - 12.03 135 184 2925 Closed Off-Road Vehicle BMW X5 (E53) 3.0 d 12.03 - 12.06 160 218 2993 Closed Off-Road Vehicle BMW X5 (E70) 3.0 si 02.06 - 09.08 200 272 2996 Closed Off-Road Vehicle BMW X5 (E70) xDrive 35 i 09.10 - 06.13 225 306 2979 Closed Off-Road Vehicle BMW X5 (E70) xDrive 35 i 02.12 - 06.13 235 320 2979 Closed Off-Road Vehicle BMW X5 (E70) 3.0 d 02.07 - 09.08 155 211 2993 Closed Off-Road Vehicle BMW X5 (E70) xDrive 30 d 10.08 - 07.13 155 211 2993 Closed Off-Road Vehicle BMW X5 (E70) 3.0 d 02.07 - 09.08 173 235 2993 Closed Off-Road Vehicle BMW X5 (E70) xDrive 30 d 04.10 - 07.13 180 245 2993 Closed Off-Road Vehicle BMW X5 (E70) 3.0 sd 10.07 - 03.10 210 286 2993 Closed Off-Road Vehicle BMW X5 (E70) xDrive 35 d 09.08 - 06.13 210 286 2993 Closed Off-Road Vehicle BMW X5 (E70) xDrive 40 d 09.10 - 06.13 225 306 2993 Closed Off-Road Vehicle BMW X5 (E70) M 50 d 08.11 - 06.13 280 381 2993 Closed Off-Road Vehicle BMW X5 (F15, F85) xDrive 35 i 11.13 - 225 306 2979 Closed Off-Road Vehicle BMW X5 (F15, F85) sDrive 25 d 11.13 - 160 218 1995 Closed Off-Road Vehicle BMW X5 (F15, F85) xDrive 25 d 11.13 - 160 218 1995 Closed Off-Road Vehicle BMW X5 (F15, F85) xDrive 30 d 07.13 - 190 258 2993 Closed Off-Road Vehicle BMW X5 (F15, F85) xDrive 30 d 11.13 - 204 277 2993 Closed Off-Road Vehicle BMW X5 (F15, F85) xDrive 40 d 12.13 - 230 313 2993 Closed Off-Road Vehicle BMW X5 (F15, F85) M 50 d 07.13 - 280 381 2993 Closed Off-Road Vehicle BMW X6 (E71, E72) xDrive 35 i 06.07 - 06.14 225 306 2979 Closed Off-Road Vehicle BMW X6 (E71, E72) xDrive 30 d 04.09 - 06.14 180 245 2993 Closed Off-Road Vehicle BMW X6 (E71, E72) xDrive 40 d 07.09 - 06.14 225 306 2993 Closed Off-Road Vehicle BMW Z4 Roadster (E85) 2.5 i 09.05 - 02.09 130 177 2497 Convertible Automatic Transmission. BMW Z4 Roadster (E85) 2.5 si 09.05 - 02.09 160 218 2497 Convertible Automatic Transmission. BMW Z4 Roadster (E85) 3.0 si 01.06 - 12.08 195 265 2996 Convertible Automatic Transmission. BMW Z4 Coupe (E86) 3.0 si 03.06 - 01.09 195 265 2996 Coupe Automatic Transmission. BMW Z4 Roadster (E89) sDrive 23 i 05.09 - 150 204 2497 Convertible Automatic Transmission. BMW Z4 Roadster (E89) sDrive 30 i 05.09 - 190 258 2996 Convertible Automatic Transmission. BMW Z4 Roadster (E89) sDrive 35 i 05.09 - 225 306 2979 Convertible BMW Z4 Roadster (E89) sDrive 35 is 09.10 - 250 340 2979 Convertible. We are proud of our customer service and will endeavor to resolve all issues in a prompt and diligent manner to your satisfaction, if you have an issue, please allow us the chance to resolve it for you. We reserve the right to refuse a return if the item(s) is not in a resalable condition. We will not accept incorrect items that are not in an unused, resalable condition in original packaging. Teemore Business Complex Derrylin Fermanagh BT92 9BL United Kingdom. Where we cannot dispatch your order straight away we will contact you and give you the option to wait or cancel. International orders are generally received in under 14 days. We do ask that all payments are made immediate to avoid delays in dispatching your order. Fuel & Oil Additives from. 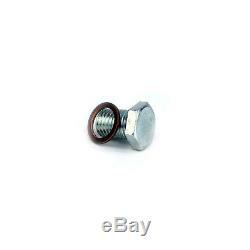 The item "For BMW Engine Oil Pan Sump Plug Bolt Screw Nut Copper Washer Seal 11137535106" is in sale since Thursday, May 24, 2018. This item is in the category "Vehicle Parts & Accessories\Car Parts\Engines & Engine Parts\Oil Sumps". The seller is "automotofactory" and is located in Enniskillen.